Hope's Cafe: Skin MD Dry Skin Lotion-Review and Giveaway!! This winter has been the worst ever for me as far as dry skin. Usually my hands dry out very easily in cold weather, but this winter I have had dry skin all over...pretty bad, too. So, when I was contacted by Skin MD to review their lotion, I was very excited. I have heard a lot of good reports about the Skin MD Dry Skin lotion. After using it for the past several weeks, I can see why! The first time I used it, I wasn't overly impressed. I am so used to lotions that leave a somewhat greasy feel that I didn't think the Skin MD was really moisturizing at all, because there were no oily leftovers. But, a few hours later I realized that my hands were soft and hydrated, without the greasy feel! After that, I was hooked. I started using it every morning after my shower, and it worked great. Even with my daily walks in the cold and wind, my skin stayed more moisturized than any winter previous! I did have to use more throughout the day on my hands and elbows, but I expected that. I am very impressed with Skin MD, and will be recommending it to friends! "Most dry skin care products on the shelf today contain harsh artificial chemicals, fragrances, colorants, antibacterial agents, and other harmful ingredients that damage your skin's protective layer and strip away natural oils. Dry skin products that contain a long list of chemicals leave skin slick and greasy in an attempt to hide the symptoms of dry skin. "The use of artificial moisturizers (conventional lotions) only masks dry skin symptoms, which can result in more dry skin," says Dr. Peter Helton, Leading Dermatologist from Helton Skin & Laser Institute of Newport Beach California. There are no regulations within the skin care industry regarding the use of the term "natural". With the move towards more natural, healthy products many dry skin care lotions are labeling themselves as "natural" when they sometimes contain toxic ingredients that are irritating and possibly carcinogenic. 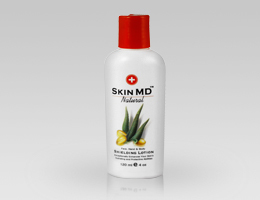 Skin MD Natural is more than 93% natural and does not contain any harsh chemicals or irritants. Its lightweight formula goes on easy and doesn't leave skin greasy. The nourishing antioxidant and vitamin rich ingredients make it the ideal dry skin care product. "The Skin MD Natural shielding lotion does provide an invisible barrier onto the skin to help protect us from all these irritants, which can lead to dry skin, eczema and other skin problems. What I like about Skin MD Natural is that it's not greasy, it goes on the skin smooth and silky and you don't even feel like you have anything on," – says Dr. Lisa Benest, a board certified dermatologist of Burbank, CA. Frequent hand washing and exposure to harsh irritants are leading causes of dry skin. A good dry skin care product should do more than just replace lost moisture; it should prevent dry skin from occurring. Skin MD Natural shielding lotion is water resistant, protecting hands from dry skin caused by hand washing, dish washing, and exposure to cleaning products. "Every day our skin is exposed to numerous chemicals and irritants just in everyday life – you don't have to be working in chemicals or with cleaning fluids to have that happen. Skin care and skin treatment is important in today's polluted environment." Dr. Lisa Benest, a board certified dermatologist of Burbank, CA." The winner of this giveaway will receive a bottle of Skin MD Lotion!! Go to the Skin MD website and tell me something you learned that is not mentioned here in my review! This giveaway ends Monday, Feb. 7, 2011, at 11:59 p.m. Please leave a valid email address in each comment, as this is how the winner will be notified. Winner will have 48 hours to respond, or another winner will be chosen. Giveaway open to US residents only. Disclaimer:I was not monetarily compensated in any way for this post. All thoughts and opinions are mine. All quotes taken from the Skin MD Natural website. Skin MD has 6 times the healing power of other lotions. I learned that the closest place to my home that I may purchase it is 30 miles away at a Hy Vee Pharmacy in Ames, IA. I like that 93% of the ingredients are natural. Please enter me in this giveaway. Thanks!